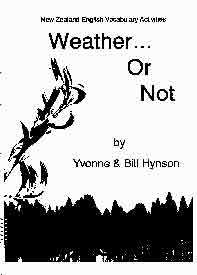 All of the materials in the books below are embedded into the third edition (series) of 'Weather...Or Not'. There are 12 books altogether with 2 for free: January Weather...Or Not & February Weather...Or Not. Open iBooks on any iOS device (iPhone, ipad etc) and search for January Weather...Or Not. Both 'Throw Away Your Dictionary!' and 'Keeping Culture in Mind' series can be downloaded from the Home page. For Android devices, I'm afraid the format is nowhere near as nice or easy to use. However, I am going to continue to work on them once the last of the iBook Weather...Or Not series (September, October, November and December) are published later this year. What the teachers think. Book reviews. 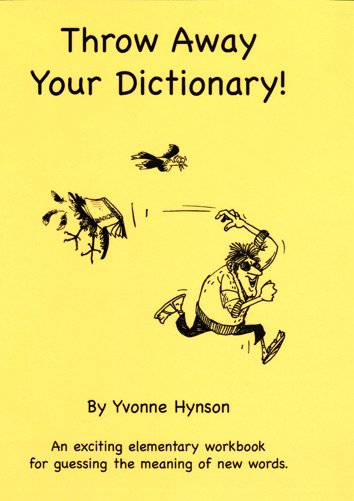 Throw Away Your Dictionary! NOW UNAVAILABLE IN HARD COPY. A workbook suitable for strong elementary to Intermediate students. Useful for teaching and practising strategies for guessing unknown words in context. Homework, self study or small group activities in classrooms of teenage to retired students. Trialed in High Schools and polytechs. The emphasis is on discovery and problem solving and encourages self anaylsis. NOW UNAVAILABLE IN HARD COPY. 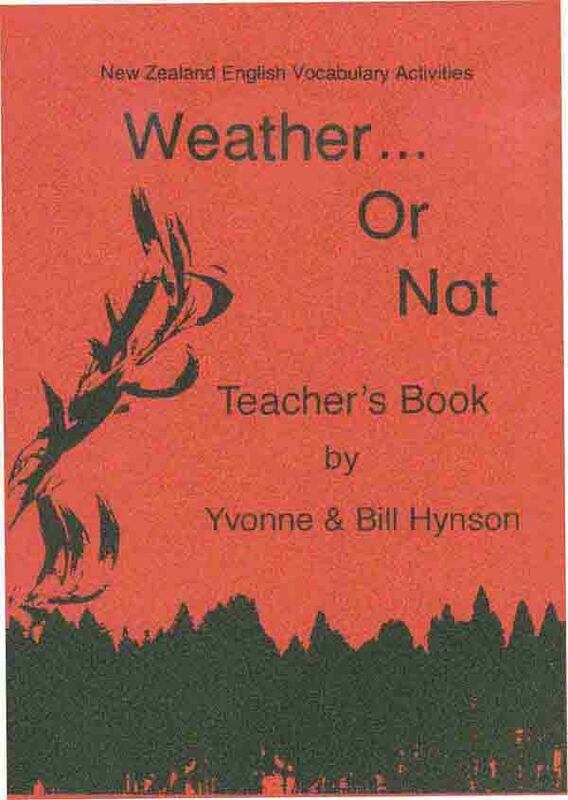 The 'Weather...Or Not' ESOL Series New Zealand English Language Activities by Yvonne and Bill Hynson. Suitable for EFL, ESOL, Adult Literacy, Home Tutoring and adaptable for primary school students. Elementary to early intermediate level Divided into 12 sections corresponding to the months of the year. Holidays, customs and seasons as they occur each month throughout the year. Each activity gives the student the vocabulary they need to talk about what is happening to them and around them in New Zealand. Trialed for 14 years with a variety of nationalities & ages (12-65). The emphasis is on fun and creative discussion. Weather... Or Not 2nd Edition NOW UNAVAILABLE IN HARD COPY. for each month (copy & cut into cards). Relevant English for each month of the year. Reading and discussion Activities, surveys, problem solving, information gaps, cultural exchange, writing exercises. IELTS style practise activities. 22 full page New Zealand photos and illustrations. with New Zealandisms and Maori words from the book, Public Holidays, NZ Maps and Pronunciation. Teacher's Book 2nd Edition NOW UNAVAILABLE IN HARD COPY. Covers every lesson in detail. Lots of ways to expand the lessons with Additional Activities to over 100 hours of activities. 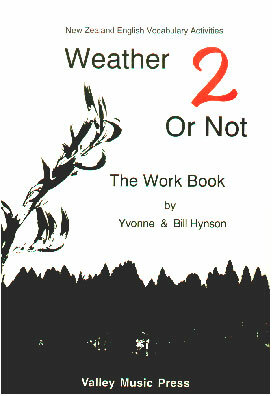 Weather 2 Or Not - The Work Book NOW UNAVAILABLE IN HARD COPY. Puzzles and vocabulary revision for Weather Or Not, Word Building and vocabulary extension. 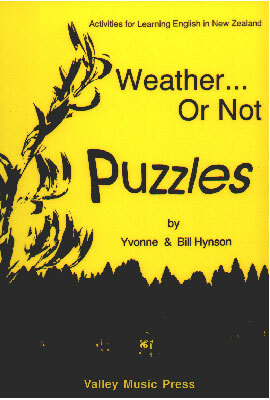 Weather...Or Not - Puzzles NOW UNAVAILABLE IN HARD COPY. A Mystery Word and a Word Find for each month of the year to revise vocabulary for Weather Or Not and extend general knowledge of New Zealand way of life.